The energy that is stored into a coil, and that comes out in the form of a spark, is proportional to the primary inductance of that coil times the square of the momentary current shortly before this current is switched off. From this equation you can see that a good match of the electronics and the coil can be very beneficial in terms of spark-strength. We advise, NOT to experiment with old coils, as a coil that still looks good on the outside, tells nothing about the inside. Proper wiring is important too. 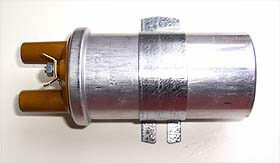 Long wires to the battery, or worn contact-switches can limit the energy delivered to the spark-plug.